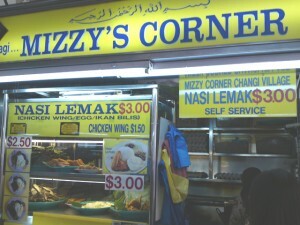 I’ve been told that International Food Stall(the longest queue one) sometimes takes their ingredients from this stall called Mizzy’s Corner at times. Well I decided not to join the queue and have a go at their Nasi Lemak this time round. Because of the lack of queue, the ingredients wasn’t as fresh, at least it’s not piping hot. 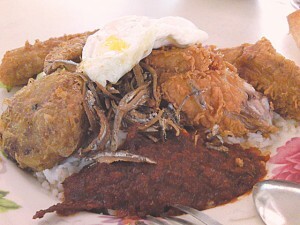 Nasi lemak + extra chicken wing and a mashed potato cost me $5. If i knew at first, I would happily trade that money for western food instead. Price: $3, $1.50 each chicken wing. Conclusion: Quality not as good, not sure if it’s due to the missing queue. The chicken wing should be equally good if it’s just got out of the wok. Their chili is a little more sweet and their rice a little more cold. Generally just lose out to International Food Stall in the overall rating. Likes: Chicken Wing goreng is bagus! Dislikes: Would be interesting if they use a little lesser sugar and add a little more salt into their chili.